Former Mayor Pat Estabrooks was heading to a 10 a.m. out-of-town meeting on December 12th when she found herself trapped in the Sackville industrial park. Estabrooks says the train was stalled on the tracks preventing anyone who lives or works in the area from getting in or out via the two Crescent Street exits or the one at the tracks on Charles Street. The train was also blocking the rail crossing about three kilometres away at Rte. 935 preventing people who live in Wood Point, British Settlement and Westcock from reaching highway 106 leading into Sackville. Estabrooks drove to all three rail crossings in the industrial park and waited about 10 minutes at one of them before heading to the public works building on Crescent Street where she asked the receptionist to alert town officials. She says she was concerned that residents who live on Charles Street, Beal Heights and Crescent Street weren’t being told anything about what was happening. Estabrooks says she took the matter up two days later with Mayor Higham and although he seemed receptive to her pleas for better communication, she hasn’t heard yet what the town plans to do if a train blocks the exits again. 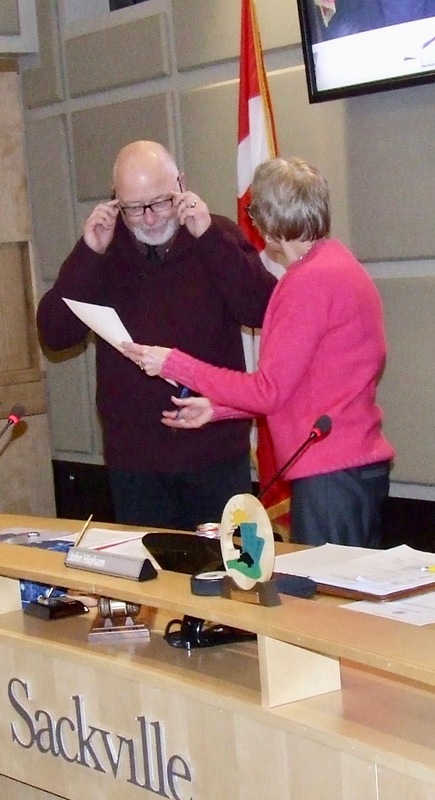 Newly elected town councillor Shawn Mesheau asked about the train blockage after being officially sworn in at Monday’s council meeting. He said he first learned about it when a co-worker who lives in British Settlement showed up late because she couldn’t get across the tracks in West Sackville. Mesheau added he had also talked with Pat Estabrooks after her meeting with the mayor who could not preside over Monday’s meeting because of urgent family business in Vancouver. “I’m just wondering what has transpired since then, if there’s any work being conducted to address this?” Mesheau asked. Sackville fire chief Craig Bowser replied that his department only learned of the blockage after it was well underway. He estimated it lasted from 20 to 30 minutes, but acknowledged he couldn’t be sure exactly how long it was. He said that by the time he arrived, first at the Rte. 935 crossing and then at the ones in the industrial park, the train had moved away. Bowser indicated that the train’s braking system had lost air pressure and that it had taken time to build the pressure up again. He said town officials were talking to CN about procedures to notify the town when such incidents occur. “So, there are steps being taken at this time to assure that if it does happen again, there’s a quicker response from CN letting the municipality of Sackville as well as emergency services know,” Bowser said. 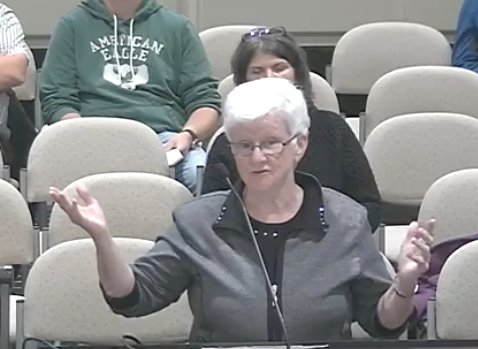 For her part, Pat Estrabrooks recalls that blocking the exits was a concern when she served on town council. “We discussed with CN, and that was before the trains were four miles long, we discussed what would happen in the event a train stopped on the track for a length of time,” she says. Estabrooks adds that by breaking the train, she understood that CN would take steps to remove cars blocking at least one of the exits so residents and emergency vehicles could cross the tracks. “So, my concern was why did they not break the train [on December 12th]?” she asks. For this incident that occurred on December 12th our procedures were followed accordingly which was to call the local RCMP centre and advise. CN Police spoke with RCMP in relation to the blocked crossing; they also called to advise when the crossing was clear. The crossing was blocked for approximately 20 minutes due to a mechanical issue. UPDATE: On January 21, 2019, Sgt.Paul Gagné of the RCMP detachment in Sackville said the Mounties did not notify the town’s fire department that the train was blocking the crossings because there was no need to. “It’s not an emergency when a train blocks the road for about a half hour,” Gagné said in an interview with Warktimes. He added that he thought the town would hear from residents in any case. “I have trouble getting my head around why this is an issue,” he added. This entry was posted in Town of Sackville and tagged CN Rail, Craig Bowser, Pat Estabrooks, Sgt. Paul Gagné. Bookmark the permalink. We need to bring back Honeymoon Bridge! Curious if any of the Sackville residents out there remember the little bridge that used to span the tracks out by the former Moloney Electric? It was a bridge for vehicles and pedestrians, I have many childhood memories of being on that bridge, as I grew up on Charles St. It was torn down sometime in the mid-to-late 1980’s I think. I don’t know who owned it, it may have been CN, but I can’t recall. That little bridge ensured that nobody could ever get trapped by a train delay. I’m sure it would be too costly to do something like that in this day and age, but it is a fun little piece of Sackville history! Robert Lapp’s wonderful, lively poem “Falling Hard at the Town Arena” was a joy to hear again after several years’ time. He mentioned that it was part of one of our theatrical poetry and music recitals and I remember that one well. Amazingly, we had discovered, and wanted to perform, so many beautiful poems and pieces of music written by, for, or about children that we decided to do two performances… AND two different programmes! His original poem was a winner. And so was “The Rink Suite” which I composed for us both to perform. Like his poem, “The Rink Suite” was intended to celebrate the wonderful new skating rink at the Civic Centre, and was quite ridiculous in many zany ways! One of the pieces required Robert and me to climb around the huge 9’ Yamaha, playing inside it from time to time, and making Zamboni-like noises…among other things. I remember, too, a fabulous piece written by Jennie (Wood) Del Motte which we performed on another joint recital in which Robert recited while tearing around the stage in the dark waving an illuminated “vorpal sword” and reciting Jabberwocky! Those were the days! Poetry and music is not always serious business…it can be a lot of fun. Many of our performances were laced through with moments of high jinks and hilarity. It was the astonishing depth and breadth of our shared experiences as conveyors of the poetry and music that remain with me today. That same fantastic range of emotions and intellectual challenge is one of the things I most treasure about the poems Robert chooses to share with us here on The New Wark Times. Thanks so much, Bruce, for bringing his readings on the CBC to us to savour whenever we wish. It is a bit funny that Sackville does not have traffic to have traffic jam… but it had a 30-minute-traffic problem caused by a train. Anyhow, thanks to those concerned, but I do not think our town or province can do much about train issues as this would fall under federal responsibility, if I am not mistaken. The pedestrian overpass project on the highway that young Alex Thomas was promoting a while back was also great idea .. and as Nathan above points out a bridge over the tracks to the industrial park should also be built for cars to escape being trapped in there .. they’re moving the ambulance station but its still ridiculous to imagine being trapped in the industrial park when a bridge could be built … there’s a youtube channel with a documentary about how they built the bridge to PEI in 1997 — human achievements are a wonderful part of the western civilization .. So surely if we can dig a $1.9 million pond we could also build an escape bridge that would benefit all — alas, it seems like council would not lead the charge — much like the great skate park project of 2013 that fell on deaf ears — it just seems easier to ignore these great ideas. Hard to believe the town will be able to manage doing anything about this issue seeing as how they can’t even construct sidewalks or crosswalks on this end of town so the people living in the surrounding area can walk safely to our business or any others that are here on exit 506. There are daycare children that have to cross the busy street or walk on side of the road when they come to the store or over to the bottle exchange with their wagon load of recyclables. I am sure Kelly, that the citizens of Sackville will be able to have input into where the sidewalks will be constructed this summer when the actual planning for the Cattail Ridge Road Reconstruction Project gets underway. I would presume a consultation meeting with local residents and businesses will be held very soon. Nothing like local citizen involvement in a truly democratic society. Thankfully we have a local BRIDGE company that could help the town put a bridge back in where the honey moon bridge is! I work for Atlantic Indistries and we supply bridges! Problem would be solved. And the town would be supporting local! Now there’s a concept! The road was blocked for all of 20 minutes and now we need a multi-million dollar bridge…yeesh. ADB whoever you are? How do you know it’s going to be multi millions of $$ for a small bridge? Do you own a bridge company or build bridges? Would be great to see your local company put that overpass in at the highway too for bicycles/pedestrians… that was a really good idea and safer for the teens crossing to the highschool and back every day on foot from this lack of progress on these kinds of projects I can only assume that the current regime in this town is just not interested in common sense projects and improvements to life here.. they have not grown the population in many years and I think after living here 8 years I understand why: lack of vision and lack of desire to do projects that are worthwhile…. yet there’s $1.9 million for a pond park.. in a town with a giant UNESCO waterfowl park full of ponds… go figure.